Has it always been a dream of yours to have a movie theater in your home but just don’t have the necessary space? Believe it or not, sometimes smaller spaces work in your favor when it comes to designing a home theater. Gone are the days of needing hundreds of square feet to have your own go-to cinema. 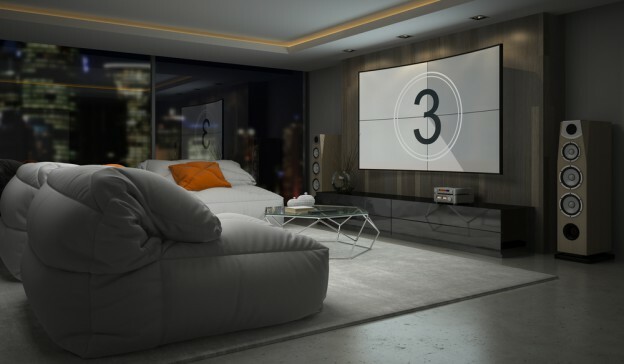 Home theaters are gaining popularity and becoming more accessible than ever for various budgets and spaces. If you’re in a small space, your options tend to be limited on where to have your home theater room. If you have a spare room– a guest room, a basement, etc– and have been thinking about converting it to your home theater, there are many tricks and tips to maximize the limited space you have. However, if all of your rooms are occupied, consider turning your traditional living room into your own personal theater. Screen Placement: In a rectangular space, try to put the screen on a shorter wall for better sound. If there is a window in the room, be aware of the potential reflection and place the television on an adjacent wall or consider investing in blackout curtains. Walls: If your roommate has ever pounded on your door because you were “chewing too loudly” that one time, soundproofing may be a priority. You want to enjoy your new setup while also being conscious of neighbors or others in the house. Acoustic wall panels are available at ranging prices and can go a long way to muffle noise and tone down any echo. Carpet tiles are also an option for those looking for a cheaper alternative. Color Scheme: Paint the theater room as dark as possible. Find a flat or eggshell neutral color, such as beige or olive. Glossy, bright colors can reflect any light in the room and can even change what colors you are perceiving on the screen. Depending on your space and preference, there are many viable options for screening and sound. Always work with the space you have, not the space you wish you had. Try to avoid buying larger than necessary just because it is a bigger option. In this case, bigger isn’t always better. No matter what you decide, placement is key to utilizing the best features in each of these options. Screen: A television is always an option, but if you are looking for movie quality in a small space, consider purchasing a projector. They can mount to the ceiling and project onto a screen or even just the wall. Sound: Most theater rooms have five full-range speakers and one low-range speaker. For optimal sound, the low-range and three of the full-range speakers should be placed in the front of the room, facing your audience. The two remaining speakers should then be placed on the side walls, slightly behind the seating. Front and center: It is important to emphasize your front, centered speaker as it is the most important. This is where the sound will directly project from your screen. When the actors are talking, it is important to create the illusion that the dialogue is coming from the screen, not from the back of the room. The low-range speaker should also be at the front of the room but can be placed in a corner. Nothing is worse than not enjoying a movie because the plastic armrests are digging into your skin or your back is cramping from the uncomfortable seats. If you want your guests to be comfortable and enjoy their experience, finding the right seating is a must. This does not mean breaking the bank, or even limiting your seating due to bulky, oversized chairs. Cuddle Seats: If a seat you can melt into is your ideal choice, consider going with a cuddle seat by Seatcraft. 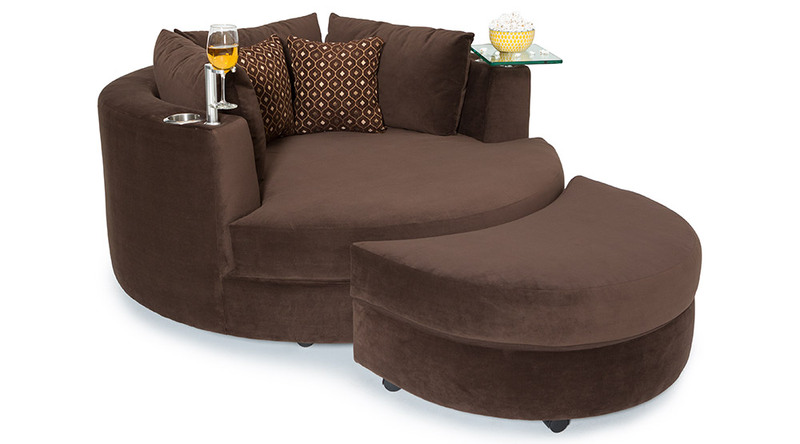 The cuddle seat is a cozy, fun option your guests can easily sink into for a long movie. It is easy to clean and the durable foam will last for years. For full service seating, consider upgrading to the cuddle couch that also includes tray tables, cup holders, and room for more than one guest. Wall-Hugger Seats: If space is your biggest concern, you can choose a more sleek chair without sacrificing comfort or accessories. Seatcraft space saver chairs can recline fully when placed within inches of a wall. The slender armrests save width space while still having room for cup holders. Whatever options work best for you, have fun creating your own home movie theater! Decide on your main priorities– sound, viewing, or seating– and create a space that meets your movie viewing needs. Utilize the strongest features of your space to provide a comfortable experience for your guests. Now all that’s left to do is sit back, relax, and enjoy the show! This entry was posted in Home Theater on January 24, 2018 by seatcraft.